Gray Sunday. Rain. Wind. Cookies. Bourbon. Brooklyn. 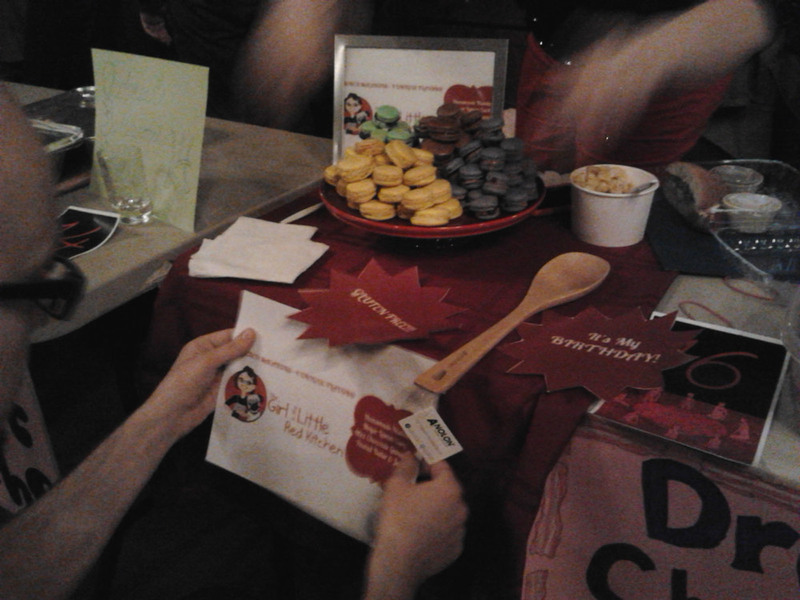 Mid-December and the 2012 Cookie Takedown at The Bell House was officially on! In my corner, I had maple deliciousness. Shaking off the droplets my cousin Melissa and I walked into a literal smorgasbord of cookies and some serious competition. For some, or many, this wasn’t just for fun. This. Was. It. Admittedly, I felt pretty confident about my original creation. I’d done a test batch and got thumbs up from discerning eaters in the form of my co-workers and got raves from members of my writing group. But, like anything when it comes to NYC, in smaller communities you feel like a master, but when facing the larger realm you realize how steep the competition is. With my tin pans full of cookies I was beside women with nice tablecloths, neon colored gloves, cute zebra printed plates and a light-up sign! Luckily fellow foodie, food blogger, fashionista, and kickass mom Angela (Mind Over Batter, by the way she's also currently doing a cookbook giveaway!) had done one of the of the Takedowns before (she placed at the Ice Cream Takedown earlier this year) and brought a lovely tablecloth. She also brought some delicious Banana Bread Re-snicker-cycle-doodles. If you like banana bread you’ll love her cookie it has the great balance of bread and cookie and a perfect banana taste. Matt Timms knows how to treat his takedowners. There were nice giveaways for all including Bulleit Bourbon, Bulleit Bourbon glasses, and a handy Anolon wooden spoon. There was free eggnog (strong stuff!) and the first round was on Matt. Winners got either a Cuisinart stand mixer and other goodies (audience choice prizes) or an electronic handmixer (judge’s choice) or baking pans (honorable mentions). Oh yeah, there were cookies galore! Unfortunately I didn’t get to partake in as many cookies as I would have liked since I was so busy serving the masses. One of the nicest compliments was seeing people nod after taking a bite of my cookie knowing that it hit a soft spot. 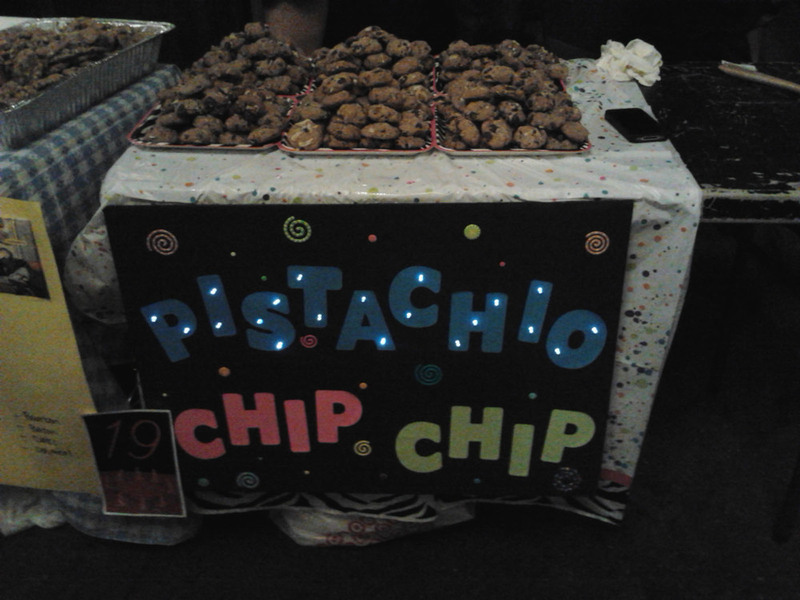 One attendee, who was friends with the ladies giving out Pistachio Chip Chip cookies said my cookie was the best of all! One of the ladies manning their table came over to me and said “My friend said your cookie was the best one here. And he’s my friend!” I was aghast and flattered and psyched up! The Cookie Takedown is a major cookie bonanza. There was an abundance of salty sweets from the salted peanut butter chocolate chip cookies (one of my faves for the perfection of something simple), salted chocolate chocolate chip cookies, one of the winners of the audience prize was a sea salted chocolate chip cookie. There was a Frankencookie (peanut butter cookie atop a brownie atop a chocolate chip cookie). 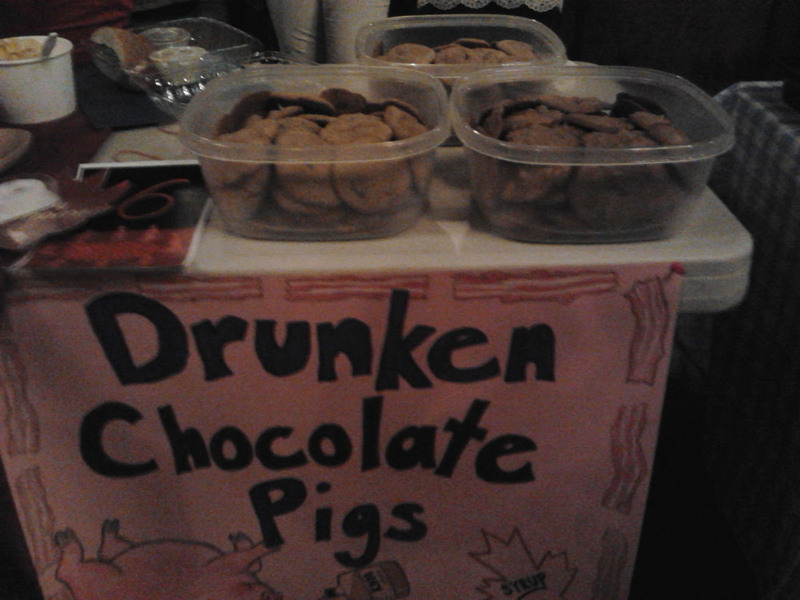 There were bacon cookies, Drunken Chocolate Pig (chocolate, maple, sea salt, bacon) and a cookie with maple drizzle. A Miso Awesome cookie, yes miso in cookie along with chocolate. There was the Fluffer Nutjob (which also placed) and a cookie that was smothered in fluff (homemade mallomars) hiding the bit of cookie underneath. There was chewy gingerbread and thyme toppings and potato chips with chocolate chips (pistachio chip chip) and pistachio cookies with pomegranate buttercream and...so. many. cookies! What was my cookie you ask? I made a maple almond praline cookie. As a fan of Vermont, and especially Vermont maple, I saw that Trader Joe’s had maple sugar! I purchased some and when I found out I was no longer on the waiting list for the Cookie Takedown but an official entrant I went to Trader Joe’s and bought a crapload more in addition to maple syrup and stocked up on maple extract. This is a chewy cookie and the maple is there but not too intense. Being that maple itself is a subtle flavor I don’t think you can overdo it, however, you definitely need a balance of maple and non-maple ingredients. I rolled the almond in grade A dark amber maple syrup and then in light brown sugar to make a sort of praline and put that in the middle of the cookie so it’d crust up while baking. Along with the chew you get a nice crunch. I got many compliments from those outside of the competition as well since I had leftovers. Something to also note...you have to make a few hundred of these. I made close to 300 over the course of two nights. And (thanks for the tip, Angela!) made dough for five straight days and refrigerated it so I could bake over two nights rather than try and balance making dough and baking. Luckily the dough I made handled well being refrigerated for several days making baking go smoothly. I made 150+ on Friday night and 120+ on Saturday night. With maple in baked goods the flavor has to settle. You will not taste maple right out of the oven, but after everything’s been sealed for a few hours and you open that sealed container anew BAM you are hit with it. And it is wonderful. So after two hours of serving cookies, tasting cookies, drinking some strong eggnog, and chatting with attendees and contestants the judges deliberated and Matt counted ballots from audience votes. We all gathered on stage and introduced ourselves (and our confections) and waited to hear the results. Admittedly, I felt a bit confident. I knew the cookie was good, but being up against 29 other cookies, well, you wonder how good. Unfortunately again, friends, I did not win. The big winner was Susan of The Girl in the Little Red Kitchen who won both the judges top prize and the audience prize for her French macarons. Yes, maple got beat out by the French. But they were well done and I don’t know if I’d have the patience to make those bad boys, especially several hundred in my own little kitchen. Do I wish I’d have won? Sure. But mostly I wish I’d gotten to taste more cookies! Seeing everyone set up and hearing them say them onstage I was disappointed I didn’t get to try more. Lucky audience members and judges. People worked hard on their cookies and the other takedowners were super nice and complimentary. It was good vibes all around on a rainy day and warm fuzzies. My cousin had a bunch of fun and again, Matt knows how to host an event and treat his people so he made it extra awesome. I may do the Cookie Takedown again next year, may not. I didn’t feel too stressed about it do to good prep but who knows. Maybe next year I’ll just sit back, relax, and with eggnog in one hand and a plate of cookies in the other take in all the goods. Sidenote: Because I was so busy distributing cookies to the public I didn’t get as many pics as I’d like but here are some great ones from Brooklyn Exposed (you can see Angela and I in one!). And SeriousEats has a nice slideshow of the event.